Spacious 2BR bedroom 1 with king size bed, night stands, wardrobe. Bedroom 2 with single bed and optional second bed, wardrobe. Bathroom with bath tub, washstand and washing machine. Separate powder room. Central heating, satellite TV, dishes, linen and towels.650sf, 2nd floor with elevator (UK: 1st floor), 11ft ceiling, two bedrooms. 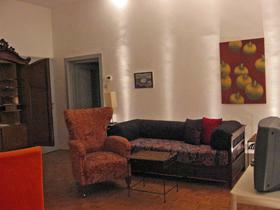 Living room with a cosy couch and comfortable chair, table for four and a wardrobe. Kitchen with fridge, small freezer, sink, gas stove (four flames) and oven, micro wave and equipment.